Home / diversity / Minorities / Geeks vs. Racism: "Why Not Make Black Superheroes White?!" Geeks vs. Racism: "Why Not Make Black Superheroes White?!" After posting about diversity here at Geek Twins for a number of years, we've pretty much become experts at racism, thanks to our comments section. Instead of addressing the racist arguments to individuals one at a time, we'll start addressing them in a series of articles so we can just post the link when someone uses the argument. Today, we'll be tackling "make black superheroes white!" This argument is usually thrown out whenever we talk about a typically white character who is changed to a person of color. Someone in the comments says, "How would you like it if I made a [movie/comic] where [minority superhero/famous minority] was white?!" Example: "They shouldn't make Captain America black! What if I made a comic where Luke Cage was white?!" It's not the same thing. I repeat, it's not the same thing. And you know it's not the same thing, which is why you said it. Let's spell it out. People of color and women don't have as many superheroes as white males. That's just a fact no one is denying. Rather than count how many white male superheroes there are, let's say there are a hundred. And rather than count all the minority and female superheroes, let's say there are ten. When one superhero is changed from a white male to (for example) a black female, you're losing one out of a hundred. When a minority or female hero is changed to a white male, we lose one out of ten. 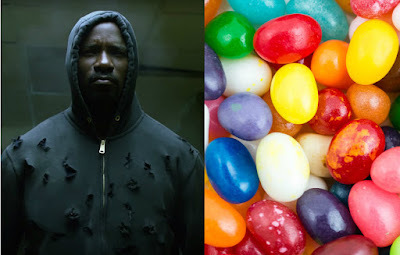 Instead of superheroes, let's talk about jellybeans. Imagine if I have five jellybeans, and you have a hundred jellybeans. I ask, "Can I have one of your jellybeans?" You say, "No! I can't spare any of my jellybeans! Besides, you already have five jellybeans! Isn't that enough for you?!" And you chow down on your hundred jellybeans while I eat my five. Next time we get together, you again have a hundred jellybeans and I have five jellybeans. I say, "Hey, I'm going to take one of your jellybeans," and I do. Now I have six jellybeans and you have 99. You say, "That's not fair! You can't take one of my jellybeans! I'll take one of yours!" And you grab two of my jellybeans. Now you have a hundred again, and I have four. The few minority superheroes that exist are precious because there are so few of them. The white male superheroes are a dime a dozen. A third of all white male superheroes in comics could be changed to female and/or people of color, and you'd still win. If you changed a third of the people of color and female characters into white males, you'd make entire comic book universes devoid of diversity at all. That's why it would be more upsetting if Luke Cage became white instead of Captain American becoming black, and that's why making Captain America black is not that big a deal. It's not the same thing. Also, because there are so few black duperheroes, usually their heritage means a lot to them. Black Panther is an African who rules and African Kingdom. Many black superheroes face racism and we're raised in primarily black communities. Being black is a huge part of their identities as people because while it can cause troble, they take pride in being black. Many superheroes are male, straight, and white because it was the 'norm'. Most white characters can be black without any problems caused by it. But if you take John Stewart and make him white, it changes the very fundamentals of that character. Some characters should stay white, while others simply are white 'just cause'. People often ignore this. There should be more diversity in the comic industry. Growing up, I had a strong and cool character to relate to-Black Panther. It's easy for us as human to relate to things that are similar to us. That's why there is such a need for more and better characters of color.